A fairy-tale landscape in sienna and ochre hues, occupying 15 acres of landscaped grounds, complete with a paddock of prancing Arabian thoroughbreds. 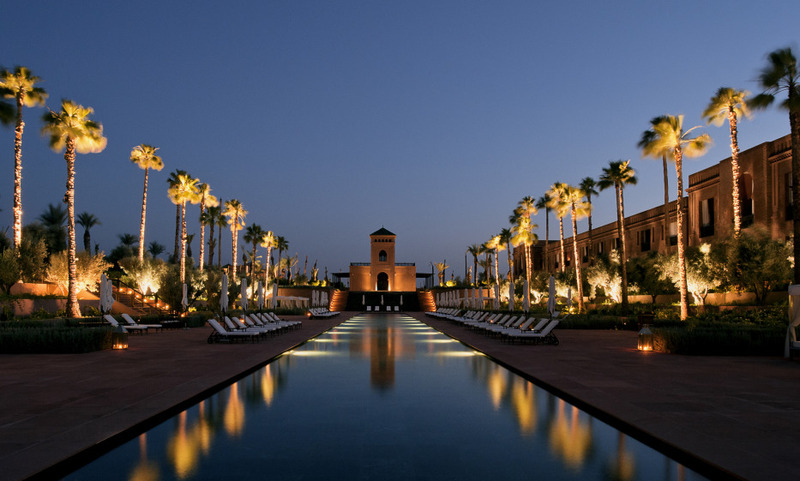 Hotel Selman’s a palace that embodies sublime Moroccan living, a place where the horses are as glossy as the 75 metre swimming pool. The interiors were designed by the stellar Jacques Garcia; the hotel’s aesthetic is best described as French Second Empire luxury meets Arabian tradition: lustrous chandeliers, purple and gold upholstery meld with ebony-stained tadelakt plasterwork and miniature monochrome zellige tiling. Quite special hotel, with huge sunken pool, Arab horses, fields of white roses and amazingly long corridors. The decoration is very ornamental and opulent but done in extremely good taste with lots of real antiques giving it an authentic character. The elevator smells of sandalwood and ceilings are of intricately carved wood. It was a marvelous experience, we felt very much at home which rarely happens in such a big hotel! All the staff members were absolutely very kind and helpful and deserve and i must admit that i always have high expectations so i rarely give a 10! This is a very nice hotel with beautiful exteriors and very friendly personnel. The airport transfer by Range Rover was perfect. The only problem: it’s too bad that the pool was not heated. Because though it’s massive, with the bad weather, you can’t really make the most of it. Loved it...they took great care of me and it was very serene which is what I wanted. Easy to go in a taxi to the Medina to shop or site see when I wanted but back to my lovely room and pool in 10 minutes! I would come here again and again! I.ll return back directly and would Tell friends about the experience. Though, as a Champaign consumer, very expensive. A magical place, calm and relaxing. We’ve got great memories here and we will come back for our next visit. A beautiful hotel decorated by Jacques Garcia. So, I would say that it's a mix between Costes in Paris and La Mamounia. You must love the dark atmosphere created by Garcia, otherwise this hotel is not for you. Nice touches of light (beautiful Murano chandeliers) which reflect in the black marble floor. Having stayed in many beautiful hotels in Marrakech, I would say that it is part of the top 3. I recommend the Selman. fantastic, high quality services, the reception service it was great, specially Amin. He was very kind, with an amazing know-how. Very efficient.